Are you ready to make a difference in our community by helping to improve the lives of women and girls? We’re calling on all Triangle women to take action and join us. Yes! I’m ready to join Soroptimist! 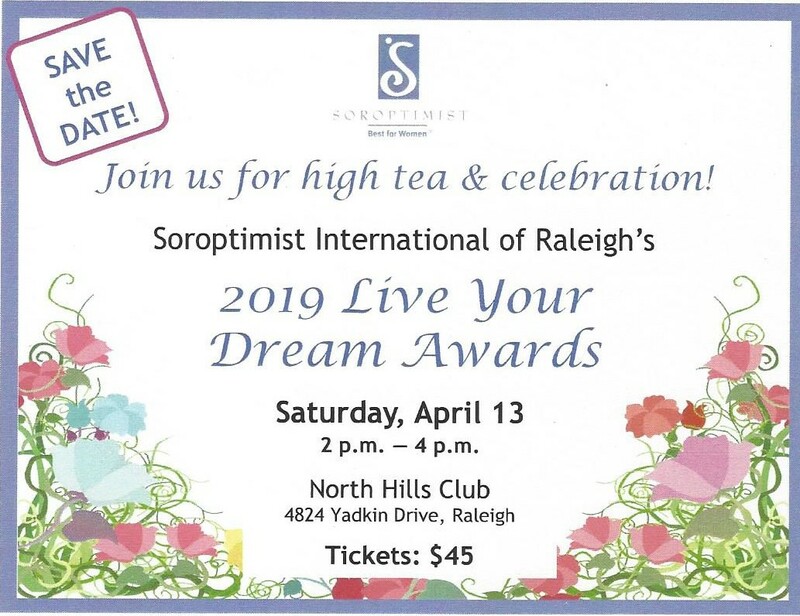 Should I choose to join Soroptimist International of Raleigh, what is expected of me? We hope that all members of the club will commit to attend monthly meetings, work on a committee, and participate in fund raising and service projects. You should expect to spend at least 6-8 hours each month in these activities. Members are encouraged to attend regional, and national and international conferences, as they are able. Most financial outlay is optional; some service projects offer the opportunity to contribute personally, but it is never mandatory. When eating is part of meetings and socials, you may be asked to participate in bringing a food or drink item, or paying a nominal amount to cover expenses. We celebrate the chartering of our club and installation of officers annually, often with a meal. Occasionally there will be an opportunity to donate funds for a special purpose. Each club member is expected to pay annual club dues*. Money collected as dues is allocated among Soroptimist International, Soroptimist International of the Americas, the South Atlantic Region, and the Raleigh Club. Since we are a 501 (c) (3) organization, dues are tax deductible. Why Should I become a Soroptimist? What fundraising activities do members of the Raleigh club participate in to fund service projects? Selling and delivering beautiful poinsettias to individuals and businesses in the Raleigh area. The sales effort occurs in October and November with plants delivered between Thanksgiving and the second week in December. We typically sell more than 1000 plants each year. Selling gift cards good at Autobell Car Washes around the south just prior to the December holidays. With no expiration date, they make excellent stocking stuffers and gifts for service providers such as nail techs, mail deliverers, et cetera. Other projects as they arise. Since 2004 we have also sold Easter Lilies and other spring plants to area churches, businesses, and individuals, as well as other efforts. How is the Raleigh Club organized? We operate with a board of directors to conduct the business of the club. The decisions of the board are reviewed with the club membership. That membership is called upon to vote on items of interest to the club as the Board deems necessary. Committees address the areas of finance, service, membership, fund raising and programs, making recommendations to the board and the membership. Other committees are formed as required. Committees report regularly to the board and the membership. When does the Raleigh Soroptimist Club meet? Installation of officers at a member’s home in June. Wrapping gifts for children and celebrating the holiday season in December at a member’s home. In addition to our regular meetings, in November we also celebrate our club founding. November 21, 2017 marked our Thirtieth Anniversary. You are welcome to attend any of our meetings to learn more. Several times a year we hold a Get Acquainted Wine and Cheese Reception for prospective members. For additional information, or if you would like to talk with a member of the Raleigh club, please contact us.